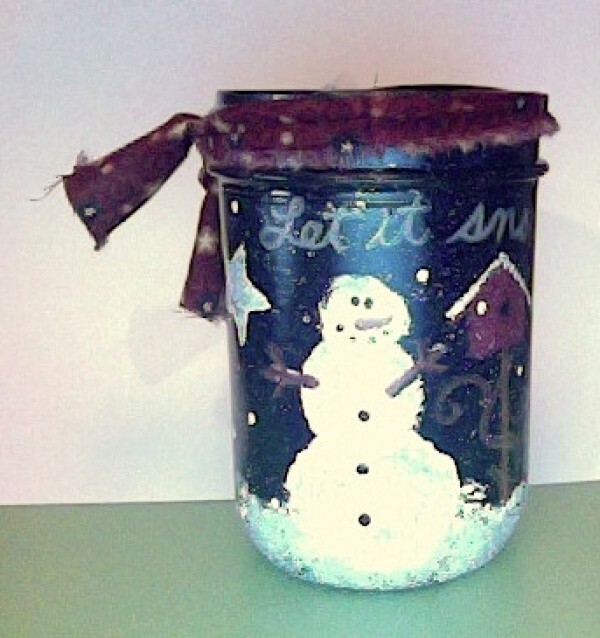 There are many ways to decorate a new or recycled jar for a festive holiday gift or decoration. This is a guide about making a jar snowman. 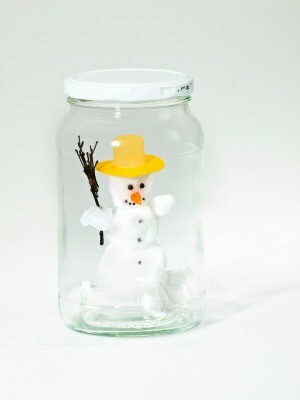 Create cute snowman jars from canning jars or mayonnaise jars. These are great for giving layered cookie mixes, party mixes, or any homemade goodies. Use knife to cut 1/2 inch from one side of ball, forming a flat surface for bottom of head. Glue bottom of ball to top of jar lid. For eyes, cut two 1/2 inch diameter circles from felt or fun foam. Glue eyes to head. Inset pins into black beads and insert below nose to form mouth. For arms, insert twigs or chenille stems into the lower part of the styrofoam ball. For scarf, tie fabric strip around bottom of ball, covering rim of lid. Turn cuff down on sock and insert small amount of fiberfill into end of sock. Tie a ribbon around end of sock just below fiberfill. Slide sock over the head. Glue buttons or fun foam circles down front of jar. Use an old or new wide mouth jar as your holiday candy holder. Paint any design with acrylic paints. Spray with a sealant like clear varnish spray. Add a touch of whimsy with a fabric tie. Add treats. I decided not to bake homemade items this year because of flu fears. I chose wrapped candy instead, collecting hard candies on sale after Halloween and purchasing a couple of large bags chocolates at Sam's, but I wanted to add a special touch. So I painted the tops of the jars like Snowmen faces. This works especially well with canning jars. Everyone smiled when they saw these smiling frozen men! Brush sealer on the tops of the lids. Dry. Basecoat twice with white. Dry. Add faces as shown and dry. Load flat brush with half white and half sky blue. Paint around the edge of the lid. Fill jars as desired, tie on ribbon to resemble scarf or just a bow, if desired. 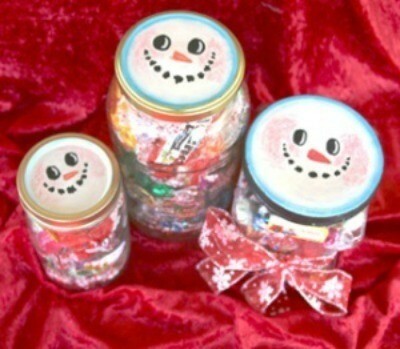 Decorate baby food jar as snowman to hold candy. Remove lid from jar and use as a guide to cut a circle of red or green felt. 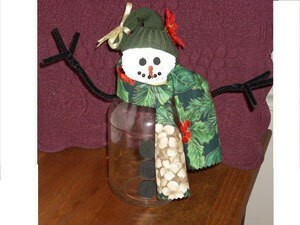 Here's a cute, easy to make Snowman you make from a jar, some flannel, and raffia. These cute little snowman are easy to make and can be filled with some candy. Save your glass mayonnaise jars. Stuff a dollar store winter cap with old Walmart bags. Glue edge of cap to the rim of the jar lid. Next, using some "snow in a can", spray almost all the way around the jar with the fake snow. 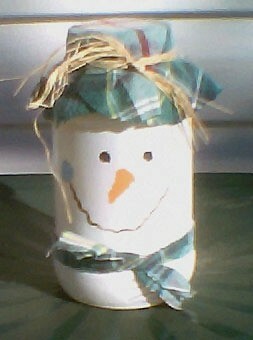 I want to paint snowman faces on glass quart jars but I'm not much of a painter. Could someone tell me an easy way to do this? I've looked for patterns for this but haven't found any as of yet. Help? 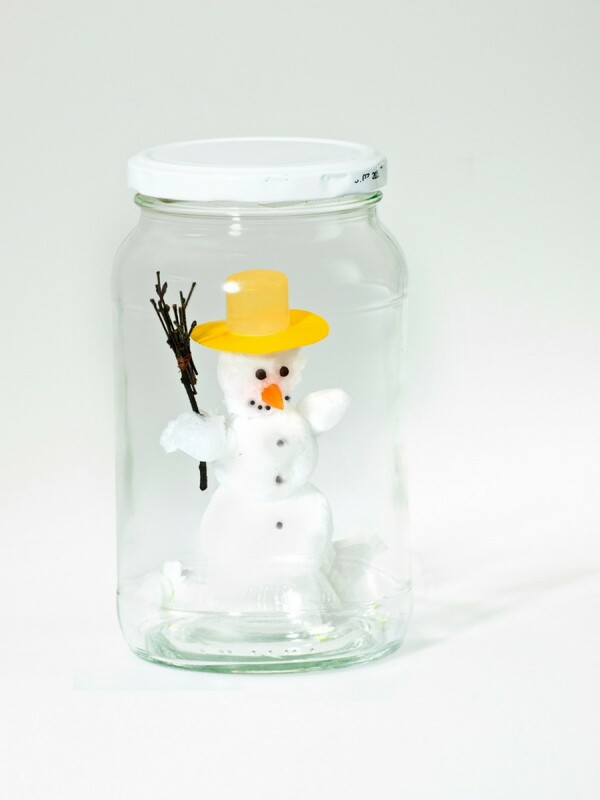 Editor's Note: Here are tips on making snowman jars. Here are several sites to look at some have other sites to go to have fun and look around they are some wonderful things. Good Luck. Practice first on a sheet of paper with a pencil. You're a better painter than you think! you could stamp it on. they sell stamping ink in all colors that is permanent and will not wash off. it's called stayz on sold in the scrapbooking department. Use any stamp you like. The ink costs about 6 dollars. I did ceramic tiles with this before. I've made snowman salt jars. You cut black circles glue to inside of jar, cut orange carrot shape glue inside of jar small black circles to form mouth, glue inside let dry. Don't use lots of glue, just to stick. A little patience needed. fill with bath salts or table salt. Make a hat from old sock cuff for hat. Place it on lid. Tie ribbon to make tassel. They're super cute. I saw some jars painted in white with snowman faces on them. The paint was textured. What kind of paint was used? Anybody know? From what you are describing I believe the paint used was an acrylic texture medium for painting on glass. This is the only pain that has a texture inside the paint that is used on glass. Since I didn't see the project I will have to speculate. Might have been puffy paint, or just craft paint and add some fine craft sand. Martha Stewart makes a special paint for glass. 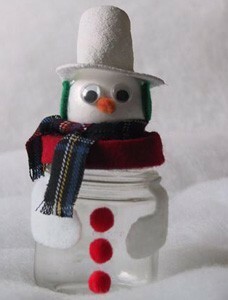 Does anyone have jar patterns for snowman light jars? I would suggest changing your mind and not making this project. There was an email going around that after having them lit, the wires get a faded look to them and they can possibly cause a fire.